Abies forrestii, first described by C. Coltman Rogers in 1919, is commonly known as Forrest fir, or as 川滇冷杉 (chuan dian leng shan) in the Chinese language. It was named after George Forrest (1873-1932), a Scottish botanist, who became one of the first explorers of China's then remote southwestern province of Yunnan, generally regarded as the most biodiverse province in the country. Abies forrestii var. forrestii, the type as described here. Description. Forrest fir is an evergreen coniferous species of tree which will grow to a mature height of 130 feet (40 m) tall with a 60 inch (150 cm) diameter at breast height with a straight, round trunk and broadly conical crown. At first, its bark is smooth, brown-gray, becoming dark brown and longitudinally fissured with age. Twigs are purple- or orange-brown, graying with age, smooth or finely grooved, glabrous or pubescent. Buds are ovoid, 0.16 to 0.4 inch (4 - 10 mm) long by 0.19 to 0.3 inch (3 - 7 mm) wide and resinous. Leaves are spirally inserted, densely crowded on the shoot over several ranks, parting in the middle, 0.8 to 1.2 inches (2 - 3 cm) long by 0.1 inch (2-2.5 mm) thick. They are linear, flat, dark green or somewhat glaucous above, with a midrib and two whitish stomatal bands below; apex usually notched but sometimes obtuse, acute or acuminate. Pollen cones appear on lateral branchlets and are 1.2 to 2 inches (3 - 4.5 cm) long (the largest reported in Abies), and are yellow with purple microsporophylls. Seed cones also appear on the laterals. They are thick, cylindrical with obtuse or depressed apex, 2.5 to 4 inches (6 - 10 cm) long by 1.6 to 2 inches (4 - 5 cm) wide, and are purple-Blue with Blue bracts ripening dark brown, disintegrating to leave a very thick rachis. Seeds are brown, obovate, 0.3 inch (8 mm) long with a 0.4 inch (10 mm) obovate light brown wing. Distribution. This species is native to China and Tibet — northwestern Yunnan, southwestern Sichuan and southeastern Xizang (Tibet) provinces in high mountains at 7,700 to 14,000 feet (2,400 - 4,300 m). The climate is cold and wet with annual precipitation of 40 to 80 inches (1,000 - 2,000 mm), producing grey-brown podzol soils. It is typically found in pure stands near tree limit. 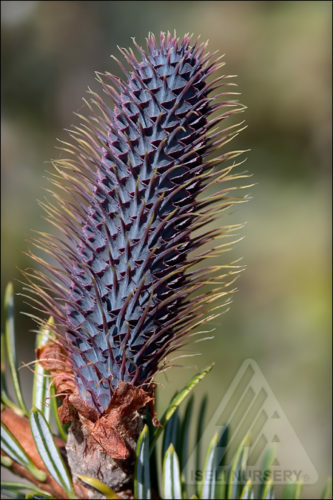 The young developing female cone of Abies forrestii var. forrestii. 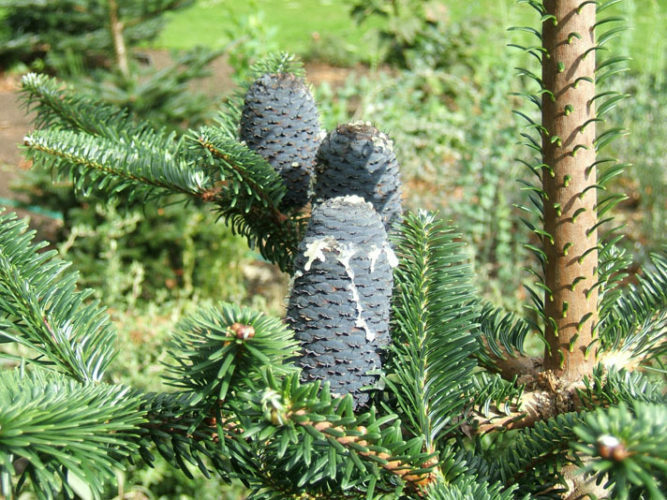 Abies forrestii — a closeup of foliage and seed cones.